Scan files within a folder and generate the MD5 file hash. 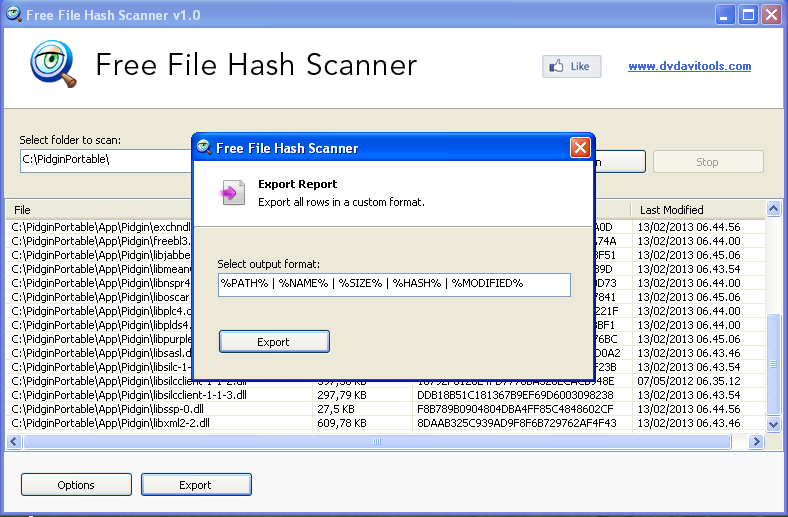 Free File Hash Scanner is a very easy to use program designed to scan an entire folder (and all its subfolders) and generate the file MD5 hash of any file that matches the file mask specified by the user (for example: *. * or *.pdf or *.doc). This application is particularly useful to generate text files containing file location, file size and file MD5 hash of each file, allowing you to specify the output format, such as %PATH% | %NAME% | %SIZE% | %HASH% | %MODIFIED%. You can specify to scan subfolders, skip files of 0 bytes (empty files) and scan only Portable Executable (PE) files.